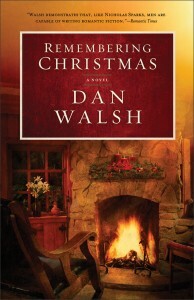 Remembering Christmas by Dan Walsh is another perfect Christmas read. The action begins and ends in the present but the main body of the book is set in November and December 1980. It is a book about awakenings and transforming lives. Rick is happy with his life living in a condo and working in business when he gets a call from his mother Leanne, to come and look after the Book Nook. His stepfather Art is in hospital with an aneurism. Rick reluctantly comes. He is the complete opposite of warm, loving, easy going Art and Leanne. Rick is far from God, motivated by business targets, money, outward appearances and he has little time for people. Rick is way out of his comfort zone in the Christian bookstore. Maybe time away from his pressurised job is just what Rick needs even though it is not what he wants. Prayer is the most powerful thing anyone can do. Prayer may be answered immediately or over many years but it is always answered. There are many prayers uttered within the novel and there are many answers. Dan Walsh demonstrates the power of kindness within the novel. Art and Leanne are Jesus’ ambassadors here on earth. They take time out of their lives to listen to others, dispense advice and generally be kind. Homelessness is a subject tackled within the novel. JD lives behind the Book Nook in a cardboard box. Art sees beyond JD’s circumstances. He sees the person of JD. Rick looks at JD’s outward appearance and he judges him. Rick has preconceived ideas and prejudices against homeless people. Dan Walsh exposes these myths to reveal the person inside. Rick has other prejudices and preconceived ideas going back years. These are all affecting his quality of life. Can anything or anyone ever open Rick’s eyes to the truth? The theme of single mothers is raised within Remembering Christmas. They have it tough. They are not always single through choice. They need friendship, love and support. Within Remembering Christmas is the theme of identity. Rick needs to find the ‘real’ him. He also needs to be the person whom God created him to be and not the corporate businessman dancing to the world’s tune. Who is the real JD? Who was he before he became homeless? People matter to God and they should matter to us. Bishop Charlie struggled with his identity as he rose through the church ranks. He wondered who he was becoming as people treated him differently. Art told him “you don’t have to be anything else to Him other than who you really are.” Charlie needed permission to be himself. It is important to identify our ‘real’ selves and to be open and truthful to who we really are. Remembering Christmas showed various bonds of love – God for His children; mothers for their children; spouses for each other. Everyone needs someone to love them and to be there for them. Great love is demonstrated within the novel by Art and Leanne. I totally enjoyed Remembering Christmas. It was a warm book but also realistic – people struggle and it isn’t always ‘happy ever after’ for everyone. I do enjoy Dan Walsh’s novels. He always leaves me wanting more. Remembering Christmas is a delightful read in the run up to the festive season.